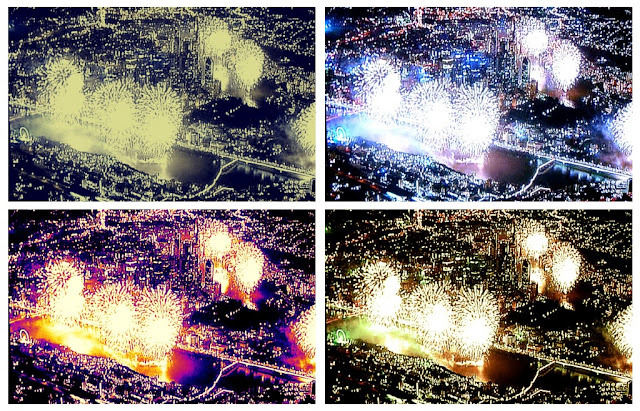 A Welsh girl in Australia: Riverfire Fireworks and a photo editing chat. Riverfire Fireworks and a photo editing chat. 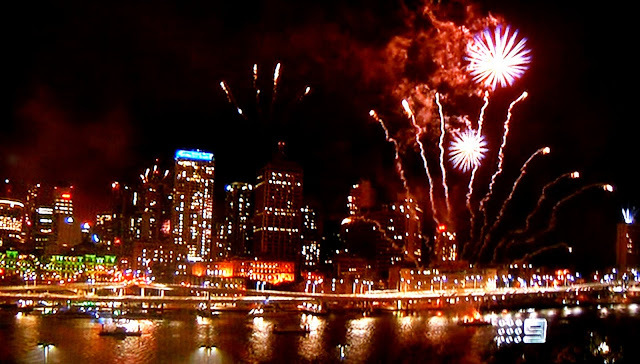 It's Brisbane Festival month here and it all kicked off on Saturday night with Riverfire. The Brisbane river came alive with a spectacular firework and light show that followed the meandering waterway. A couple of years ago we were very lucky to have a birds eye view from an office block overlooking the Storey Bridge and saw a similar scene to the one above. 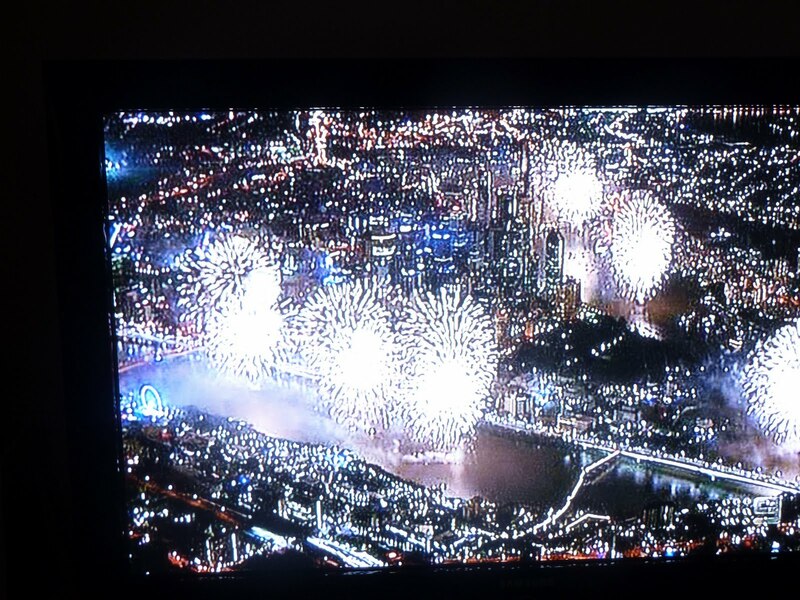 This year however, we watched it from the comfort of home and I cheated and took these photos from the TV (thank you Channel 9). At one point we watched the telly and turned the volume off so that we could hear the noise of the fireworks. There was no flyover by the F-111 jets this year - the noise from those jets used to make the windows rattle so I didn't miss them too much. As I took these photos from the TV, I have been playing around with a photo editing package this morning to enhance them a bit, it's called 'picnik'. Most of it is free but there are premium applications that you can upgrade to. I've used it for a few months now and so far have not seen the need to upgrade. You need to register an account even to use the free version, but this is quite straightforward. It has all the basics like, crop, exposure, colour enhancer etc and then a whole range of effects. I used the 'boost' effect to bring out the colours of the fireworks in the images above. You can frame your shots and add text and stickers. It also enables you to do some collages with a limited range of options of number of shots to include. Then you can play around with the spacing, the colour of the background and the make up of the photos. This collage was a combination of infra-red; duo tone; a little boost and night vision. Here's the original shot as it looked direct from the camera. A bit wonky with a black frame, so it was straightened and then cropped and then fixed up a bit. One of the really useful things I have found with picnik is that it compresses the size of the photo which then makes uploading onto the blog a whole lot faster. You can save it to your hard drive or direct to a picasa web album ( if you use this for your blog), or to twitter, flickr, facebook or photobucket. I am a bit organised when it comes to saving photos, so I will usually download from my camera and save into a monthly file (sometimes I'll create other files within the months for significant events such as birthdays or holidays). If I then want to use a photo on my blog I will edit it through picnik and then save it in another file named 'blog' and that is also organised by months. That way I can find things....well, most of the time! If I use my own photo on the blog I will add a small "a welsh girl" text in the bottom corner. It sounds a bit cumbersome when I'm writing this, but it's actually really easy. Just ask if you want to know anything more and I'll try and help. There's lots of power tool noises and banging and dust going on here this week...some subtle but exciting changes to the back of the house. It should be finished in a few more days, so I'll show you then. I use Picnik too - it's wonderful how you can turn a fairly ordinary picture into something completely different in a matter of clicks. I can spend hours playing around with my photos. I wish I was able to take better pictures myself but with Picnik there's no need! Great pics, even though they are from the tv! And a whole lot nicer to look at than that ugly toad you posted about yesterday! ps. I also use Picnik to edit my photo's!